PHNOM PENH, July 18 - Cambodia sent extra troops to its disputed border with Thailand on Friday, as both sides insisted the flare-up over an ancient temple was unlikely to get violent. Thai Supreme Commander Gen Boonsrang Niempradit said a joint border meeting on Monday should find an "amicable solution" to the four-day stand-off at the Preah Vihear temple, which has worried investors it might lead to a serious confrontation. "The situation is unlikely to escalate into violence," Boonsrang, the country's top military commander, told reporters in Bangkok. Cambodian officials echoed similar views, although Prime Minister Hun Sen warned on Thursday that the situation was "worsening" because Thai forces had not withdrawn from the temple site that has been a source of border tensions for decades. But the former Khmer Rouge commander, who faces a general election later this month, said he still hoped to "resolve the problem through negotiations." Nevertheless, a Cambodian convoy of four heavy military trucks with mounted machine guns and two smaller trucks were seen driving from the capital, Phnom Penh, to the border. The soldiers were armed with rocket-propelled grenades and automatic rifles. 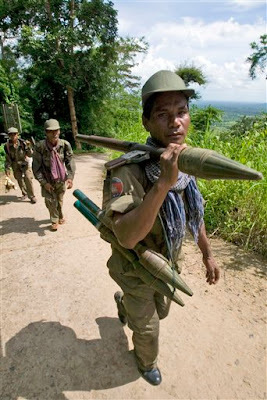 "I am leading these men to reinforce our troops at Preah Vihear," General Yim Sanh. With hundreds of Thai and Cambodian troops facing off on the border, there are fears it could escalate into a major row five years after a dispute over another Cambodian temple, Angkor Wat, saw a nationalist mob torch the Thai embassy in Phnom Penh. General Nipat Thonglek, head of Thailand's Border Military Affairs Department, denied reports that Thai and Cambodian soldiers had pointed their rifles at each other last night, saying both sides "have agreed not to use violence." Chea Mon, Cambodia's military commander at Preah Vihear, said: "We are facing each other, but we leave it to our leaders to solve the problem." The 900-year-old Hindu temple has been a source of tension since the International Court of Justice ruled in 1962 that it belonged to Cambodia, a decision that still rankles Thais. The listing of the temple as a World Heritage site this month triggered a political uproar in Thailand stoked by groups seeking to oust Prime Minister Samak Sundaravej's shaky ruling coalition. Thailand's main stock index .SETI has fallen more than 23 percent since anti-government street protests in Bangkok started in late May, and could drop further if border tensions get worse, dealers said.